Position a rack in the upper third of the oven. Place a large cast-iron baking dish or a rimmed baking sheet on the rack and preheat to 500 degrees F. Put the potatoes, garlic, olive oil, 1 tablespoon water and 1/2 teaspoon salt in a large microwave-safe baking dish and toss to coat. Cover with plastic wrap, pierce the plastic in a few places with a knife and microwave 8 minutes to partially cook. Meanwhile, pat the chicken dry and transfer to a bowl. Sprinkle with the paprika, 1 teaspoon salt and 1/2 teaspoon pepper. Add 2 tablespoons parsley and the lemon juice; toss to coat. Set aside. Remove the hot baking dish from the oven; carefully add the potatoes and spread in an even layer. Scatter the onions on top. Roast until the potatoes start to brown, about 12 minutes. 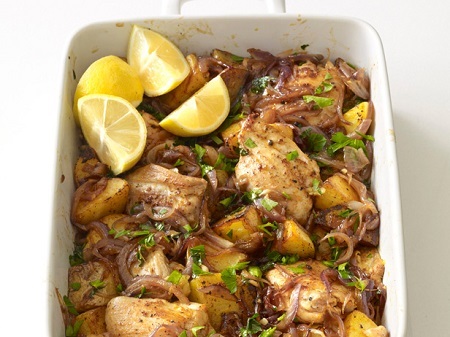 Flip the potatoes and lay the chicken pieces on top, adding any accumulated juices from the bowl; return to the oven and roast until the potatoes are tender and the chicken is cooked through, about 12 more minutes. Remove from the oven and top with the remaining 2 tablespoons parsley. Serve with the lemon wedges.